After you’ve taken care of your family and loved ones, you may wish to think about what else is close to your heart. 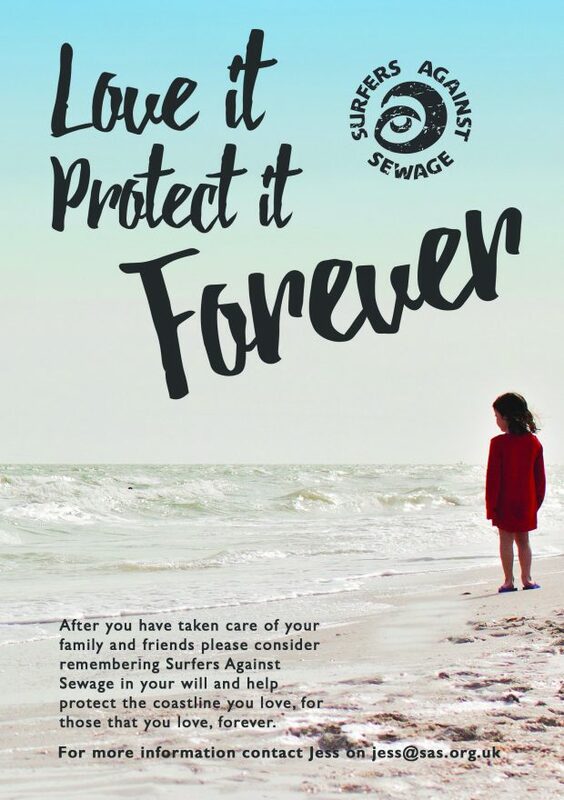 By leaving a gift in your will no matter how large or small to Surfers Against Sewage, you can carry on protecting the oceans, waves, wildlife and beaches that you love, long into the future. As a small, yet powerful charity you can trust that your gift will go a long way, with 84p in every £1 donated going directly to the protection of the UK’s coastlines. £500 – could pay for our Education Officer to visit 10 schools in your area to run a workshop empowering and inspiring local children to create and implement’ Anti Litter Action Plans’ with their classmates. £10,000 – could help our campaigns team to organise campaign actions throughout the year and lobby government and industry. You may wish to leave any of the following as a gift to your favourite marine environmental charity. A share in your estate Also called a Residuary Legacy. This is when you specify a percentage of what is left over after everyone else has been taken care of. A specific sum Or a Pecuniary legacy. You might want to leave a specific amount to SAS. A specific item Or you might want to leave a certain item, such as a surfboard, a piece of artwork or jewellery or perhaps your car or house. Making or adjusting a will is easier than you might think and we are happy to help with anything you might need so that you can be sure your legacy goes to the people and causes that matter to you. Get in touch with our Deputy Head of Fundraising & Communications, Jess North on [email protected] or phone 01872 553001 if you would like to chat about how we can help you make or amend your will. Step 3: Decide who you would like to provide for and how. If you have children, you will need to choose guardians for them. Step 5: Keep it safe and up to date. Most people keep a copy in a safe place and a copy with a solicitor. You should review your will every 5 years and after any major life event. You may already have a will in which case you can always add an amendment to include a charitable donation, if just 4% more people did, it would generate an incredible £1 billion more for good causes in the UK every year! This is called a codicil, which is just an extra form to be stored with your will, you don’t even need to see a solicitor.